"What kind of place is this, that doesn't have one damn machine gun?" Americans aren't often aware that there's a whole enormous body of Spaghetti Westerns that have nothing to do with Clint Eastwood or Sergio Leone. Anchor Bay is doing their best to remedy that by bringing a few of the classics of the genre to DVD in their Spaghetti Western Collection. One of the best of these less well-known works is Damiano Damiani's highly politicized A Bullet For the General (onscreen title El Chucho). Gringo Bill Tate (Lou Castel) is traveling by train to Durango in 1910s' Mexico, a time of revolution and wandering bandolero gangs. 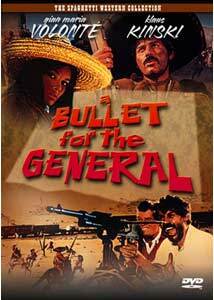 When the train is ambushed by El Chucho (Gian Maria Volonté) and his gang, Tate makes the best of a bad situation and after being christened El Niño, joins the bandits, who are collecting guns for the revolutionary General Elias. A lengthy section of their adventures follows, but when the bandits hit the village of San Miguel, El Chucho begins to enjoy adulation a little too much, leading to friction amongst the members of the gang. This leads to a harrowing confrontation with the federales in the desert, as well as a couple of examples of poetic justice. Quite violent for its time (though not gory, it should be noted), the film is action-packed and has a good sense of humor, yet as noted above it is heavily political in nature. The script is by the authors of the notorious Battle of Algiers, and is accordingly highly sympathetic to the leftist revolutionaries. In particular, the closing sequence makes no bones about where the filmmakers' essential sympathies lie. Yet it is not quite that simple, for the bandoleros also engage in a bit of harrowing house invasion that exposes the seamy underside of the movement for redistribution of the land, exposing it as naked greed no better than that of the manorial landowners.There are plenty of iconic images to be seen, not least of which is El Niño's costume of gray fedora and pinstripe suit, kept impeccable despite what seems to be months in the desert. The ambush of the train is a memorable moment as well, for the ambush is staged by El Chucho placing an army captain on a pole on the tracks, and the standoff of the train and the suffering captain is a vision that will stay long with the viewer. The battle in the desert, with the unveiling of El Chucho's prized machine gun, is also unforgettable.Volonté is excellent and endearing as the revolutionary hero with feet of clay. Castel is suitably mysterious and cynical. Martine Beswick (best known as the Bond Girl in Thunderball as well as several Eurocult favorites) is gorgeous as always, despite makeup that is meant to downplay her beauty. She displays a venomous temper as well as conflicting affections well. Rounding out the cast is the always terrific Klaus Kinski, as El Chucho's religious fanatic brother. He merrily blows up troops while reciting prayers, and I don't think I've ever seen Kinski smile so much in a movie before; it's almost more unnerving than his usual scowl.Edited to move at a fast clip, this is always entertaining despite the heavy political message. The adventures of the bandit gang collecting guns are a series of wild picaresque exploits that cannot help but amuse. This is a worthwhile addition to any DVD library. Image Transfer Review: The anamorphic scope picture looks quite good, apart from fairly heavy grain. Color is good, and detail is decent. The source print appears to be in excellent condition. The transfer is a shade soft, no doubt a remnant of an attempt to reduce the grain visible. Edges have a slightly digital appearance, but blacks are well rendered as are the many earth tones that dominate this movie. Audio Transfer Review: The (marginally) dubbed English 2.0 mono is the only audio provided. The dialogue is quite clear throughout, despite a minor background hiss. Ennio Morricone's score (which is first-rate) comes through quite nicely, without excessive shrillness or tinniness. This is a very nice mono track that gets the job done. Extras Review: Two trailers, a 2.35:1 international trailer and a 1.85:1 US trailer, both anamorphic are included. Both are in surprisingly good shape considering their age. The only other extra is a spoiler-filled set of liner notes that essentially outlines the entire movie. I'd thus suggest disregarding the notes until after you've watched the movie. There is some useful information there, however. Chaptering is adequate if not outstanding. Although a little grainy, this is a decent presentation of a classic Spaghetti Western. Anyone who likes the Dollars movies or Once Upon a Time in the West is strongly urged to give this one a try.